Although I have made this recipe my own, I must give credit where it is due. Early in my cake-making days, I purchased Rose Levy Beranbaum’s Cake Bible and used recipes out of it to make the first stages of this cake. I’ve continually changed and evolved the recipe since then, and while I always ultimately preferred to use a Betty Crocker devil’s food cake mix rather than bake the cake from scratch, I have now found THE chocolate cake recipe that I actually prefer over the mix, and I have Mel of My Kitchen Cafe to thank for that. Let’s talk about the current stage of this cake. 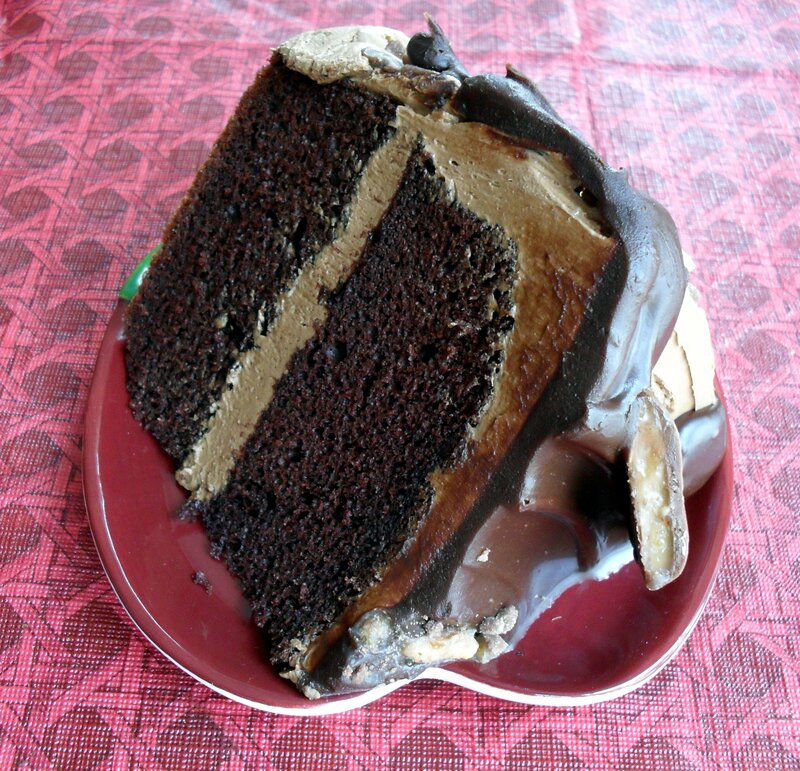 The cake itself is light, moist, deeply chocolatey. An excellent crumb. Really, the best texture I’ve ever gotten from a chocolate cake recipe, except for this one. It’s perfect. The cake is enveloped in a buttercream that is deceptively light and almost mousse-like with a great balance of sweet coffee and chocolate flavor. The flavor combined with the velvety smooth texture makes it so good that I have been known to scoop the leftover frosting into a bowl and eat it straight. I chose to press chopped toffee into the sides of the cake because, to me, the flavor of toffee has always been a perfect compliment to chocolate and coffee, and it adds a nice contrast of texture to the bite. Finally, I eventually began smothering the whole finished cake in ganache to make it more visually appealing and to intensify the chocolate flavor. It is an immensely pleasurable treat that can be dangerous because it doesn’t feel fattening when it’s in your mouth and it’s easy to overindulge because it is so light. Do not be decieved! My thighs are a testament to the immense caloric level of each bite. This cake is time consuming to prepare, but very much worth the effort, especially if you are making it for a birthday. And fear not that the little ones won’t enjoy it. My nephew has been devouring it since he was old enough to be allowed chocolate. And one of the ladies present at a birthday party where it was served told me that her daughter hates chocolate and she ate an enormous piece all by herself. I had to laugh, because that little girl is not the only one who has enjoyed the cake despite their aversions to aspects of it. A friend recently told me that this cake would be one of the only things she thought she would miss in heaven. Of course she said it to be funny since I doubt we’ll miss anything in heaven, but if were possible to miss something…I think I would miss it too. Divide the batter evenly between the prepared pans. Bake the cakes for about 32-35 minutes, until a toothpick inserted into the middle comes out clean or with moist crumbs. Do not overbake! Remove the pans from the oven and set the pans on a wire rack to cool for 15 minutes. Gently run a thin knife around the edges of the pans and unmold the cakes, removing the parchment paper liners from the bottom of the cakes. Let them cool completely, top sides ups, on a wire rack. Trim the tops of the cake layers with a long serrated knife to make them level. Make the buttercream: Put Kahlua in a microwave safe dish and heat until boiling. Remove and add instant coffee. Mixture will immediately boil up high and once it goes back down, gently stir it until the coffee is dissolved. Set aside to come to room temperature. Place the chocolate in a microwave-safe dish and heat for 30 seconds and stir. Continue heating in 15-second intervals, stirring in between, until the chocolate is almost melted. Stir and allow the residual heat to melt it completely. Set aside and allow to come to room temperature. Beat the egg yolks until light and mixer blades make tracks in them. Spray a 1-cup glass measure with cooking spray and set beside the stove. Combine sugar and corn syrup in a saucepan and cook over medium heat, stirring constantly, until it comes to a full rolling boil. Immediately remove from heat and pour into the prepared measuring cup to stop the cooking. While mixer is running, pour the syrup in a steady stream into the egg yolks, careful not to pour it onto the beaters. Continue beating until mixture is room temperature. Beat the butter in a small bowl until fluffy, then begin adding it to the egg mixture a tablespoon or two at a time, beating until incorporated after each addition. Once the chocolate is cooled, turn the mixer back on and add the chocolate to the buttercream, beating until smooth. Add the cooled Kahlua mixture and beat until uniform & smooth. Make the ganache: Place the chocolate and cream in a microwave safe dish and heat for a minute; stir. Continue heating in 15-30 second intervals until the chocolate emulsifies and the mixture is shiny, dark, uniform, and smooth. Allow to come to room temperature. Assemble: Place one cake layer on plate and spread about 1 cup of mocha buttercream over the top. Put second cake layer on top and frost the top and sides with the remaining buttercream. Take handfuls of toffee bits and press them into the sides of the cake. 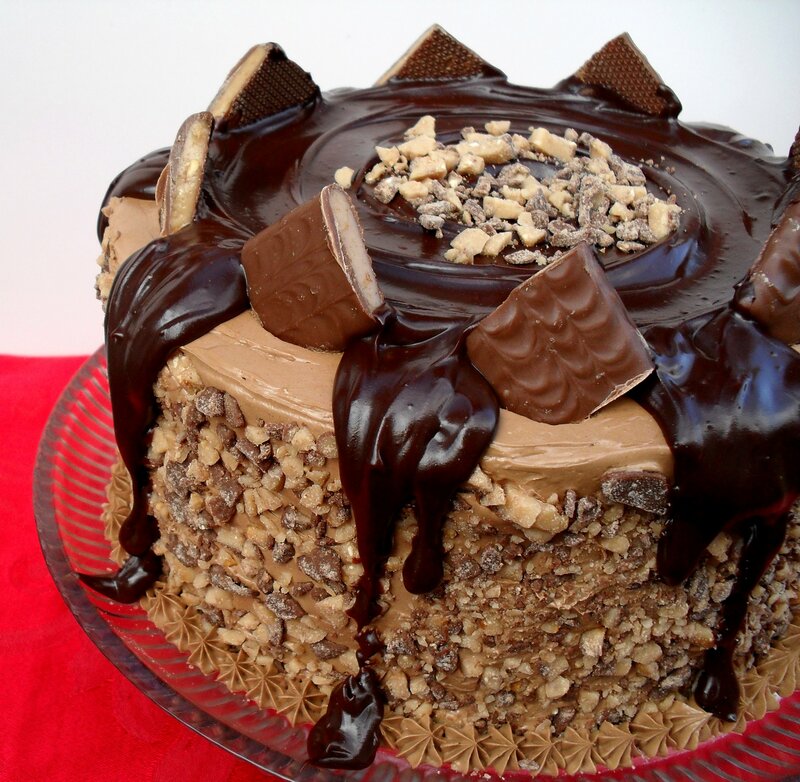 Chop the candy bars into four pieces each and place with a pointed side up around the edge of the cake. Slowly pour the cooled ganache over the top of the cake and use a spatula to spread to the edges so that it will ooze out between the candy bars and down the sides a little. Sprinkle some toffee bits in the middle of the cake. Serve at room temperature. Veronica’s notes: As many people have had trouble with the cake batter overflowing the pans during baking, I recommend you do what I did and only fill your pans 1/2-2/3 full and use the extra batter for cupcakes. Recipe by Veronica Miller, with help from this recipe, and The Cake Bible. 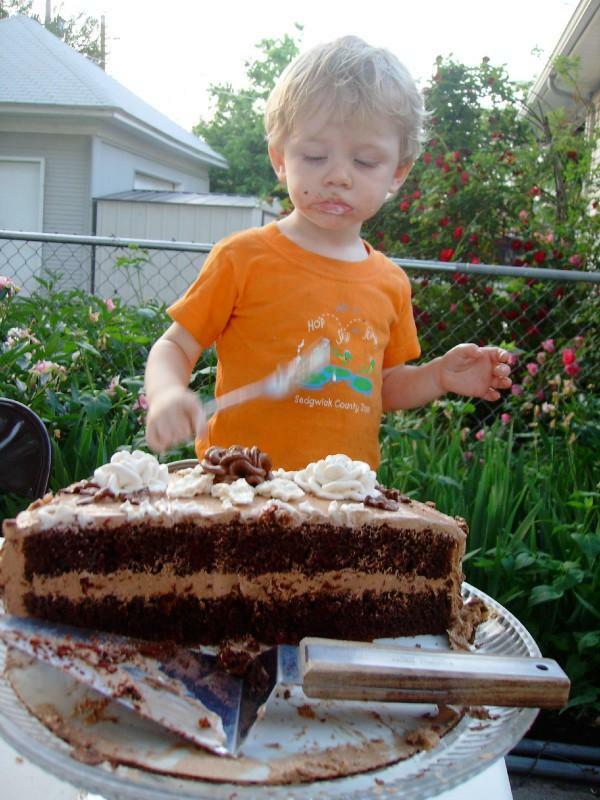 And now, a photographic timeline to show the evolution of the Mocha Crunch Cake. 1st stage: three layers of (from scratch) devil’s food cake with mocha frosting and chocolate curls. Stage 2: same as stage 1, except with toffee on the sides. Stage 4: toffee removed and baked in a sheet pan to turn into a baby shower cake. Stage 5: a ganache drizzle is added. Stage 6: no more pussyfooting around. I slathered on a whole cup of ganache and embellished with candy bars! And everyone rejoiced. The end. 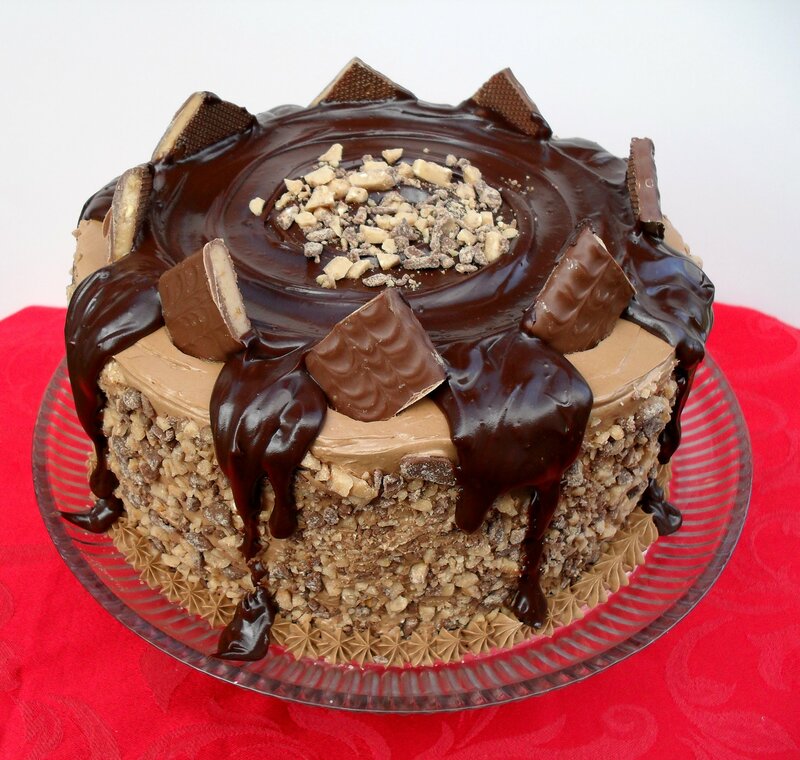 Posted in Cake & Frosting, My Favorites and tagged baking, birthday, celebration, chocolate, coffee, mocha crunch cake, recipe, special occasion cake, toffee. Bookmark the permalink. That really IS your specialty cake! I can’t believe how many times you’ve made this. This latest version is absolutely stunning! Ok I am officially obesessed as well! I made this cake with the addition of a New York Style Cheesecake in the center…OMG….I took it to a party and it was gone within minutes of cutting it! Everyone lost their minds…lol….The frosting was absolutely DIVINE. I had people who hate desserts eating their whole slice and looking for more! Thanks so much for an awesome post!!! I wish i could show you a picture…!!! Seriously, you can’t make a cake that awesome and not take a picture! Wow that sounds amazing!! Good job woman! Looks like an awesome recipe! Have you tried anything instead of Kahlua, something non- alcoholic? I have not, but if you look through the comments you’ll see Hira used a combination of coffee and brown sugar. You basically need a strong and sweet coffee flavor to replace it. God I’m so greedy, I’m gonna dream about this cake until I make it! All i can say is OMGOSH ! Holy cow, this MUST be good if you’ve made it that many times! This last one truly is a work of art! Yes, it is a pronounced coffee flavor. The Kahlua just emphasizes it more but it isn’t overpowering. But I’m telling you, the kids love it and my coffee hating hubs does too. I would love to attempt this frosting…however I dont consume alcohol in any capacity…so what can i use besides the Kahlua? How would I alter the recipe? Thanks!!! Also, this is very similar to a French buttercream. Does this recipe require the sugar syrup to come to 240 degrees? Yes but in this method some of the sugar and all of the water is replaced by corn syrup. The corn syrup provides just the right amount of water so that, when brought to a full boil, the temperature of the syrup is exactly 238F. There is no need to use a thermometer. The corn syrup also prevents crystallization. Pretty neat, huh? Kahlua is a sweet coffee-flavored liqueur but it would be difficult to get the recipe to taste right without it. I mean you could try using water instead of the Kahlua and adding more instant coffee and some sugar, but I don’t know how much. You might look for another mocha frosting recipe (I’m sure there are tons) since this one takes a while to make and if it doesn’t turn out good, it would be such a waste of effort and ingredients. Or you could just make a mixture you think would work, then just add it a bit at a time until it tastes mocha-licious to you. I’d love to hear the results if you decide to experiment! Very cool! I’d make your coffee very strong (and make sure it’s at room temp when you add it so it doesn’t melt or curdle the frosting) because if it’s regular strength, it won’t add enough flavor before the frosting gets too thin from the liquid. This looks absolutely out of this world…. Wow! What a gorgeous cake! I want to eat it off my computer screen. Thanks for sharing your signature dessert. Now after seeing this i have to make it.. i just have to.. after Thanksgiving. I want to lick the screen over and over. Not only does it sound out of this world..it looks outta this world..Thx for sharing V! WOW! That is one beautiful and delicious looking cake! This looks like a fantastic cake… you did such a beautiful job! Wow, that cake has come a long way. It is certainly an eye catcher. 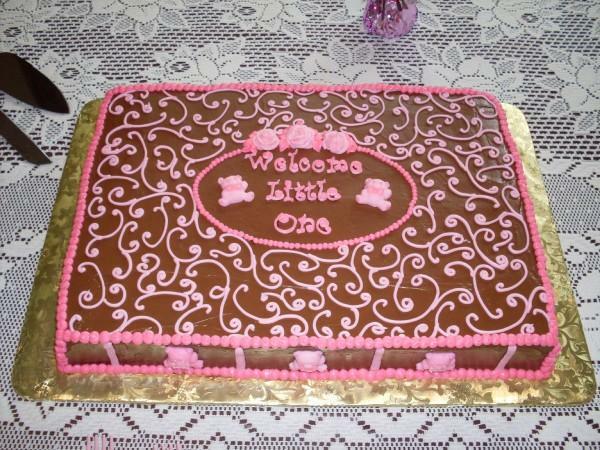 It looks like a cake you would purchase in a professional bakery. I have been searching for that perfect chocolate cake recipe too, I will have to give this one a try. I am in the process of making this cake.. something..went wrong. I have plans slightly larger than what you noted and yet the cake ran over..out of the pans and all over my oven. 1.5 cups of water seems like ALOT, the batter was very runny. This is for a dinner party tonight..and I have everything for a re-try.. thoughts? I will edit the post right now to include this information–i can’t believe I forgot to note it before! I had noticed on the comments where I found the recipe that others had problems with the batter overflowing the pans so I just filled my pans half way and then used the extra to make cupcakes. The batter is thin, that is how it should be. Thank you for bringing this to my attention so I can fix it. But the cake was soooo gooood :) Everybody who tasted it strongly agreed with me. Aw, you made your own cake! A girl after my own heart! :) I’m so glad you and your guests liked it–thank you for letting me know! This cake looks gorgeous! May I know what kind of powdered chocolate you used and also the one for ganache? Thanks. I have used Hershey’s, Nestle, and a generic cocoa powder on this cake at different times and I can’t say that one is better than the other, but of course probably the better quality cocoa powder you use the better the flavor. As for the ganache, I almost always use Nestle semisweet chocolate chips and again, the better chocolate you use the better the taste but it really doesn’t matter what you use in either case IMO. Made this cake for my birthday. I was worried that the batter was so thin, but it turned out great and did not run over the sides of my pan. The frosting also seemed on the thin side so I added 3/4 cup powdered sugar and it was perfect. LOVE this recipe! made this cake for a family reunion and everyone loved it, and ask for the recipe. Its a great cake. I am a baker and the cake turned out fabulous. The icing however is a total fail. It is way to runny. It will thicken when cool but once it starts warming up it just will run again. Much easier to use one stick of butter creamed and add kahlua and coffee (made up) to powdered sugar an make a real buttercream. Flavor and thickness perfect. Just too many steps in this frosting and too many wasted ingredients to get the same results from a regular buttercream flavored with the other items. Dang, that bites! I’m so sorry about that. It always turns out super velvety for me or I wouldn’t bother with it either. I totally understand using another one if this one didn’t work for you on the first try–it’s too much work to try again. However, for others reading this, I have never had any trouble with the recipe beyond it being a pain in the tush to make. LOL! My only guess is that you’re in a warm environment in which butter is liquid at room temperature maybe? Or that the syrup wasn’t cooked long enough. Oh, and this is actually what is called a buttercream. The kind with powdered sugar I’ve heard referred to as “American buttercream.” It’s not a true buttercream b/c it’s not based with eggs I guess. This is the only recipe for real buttercream I use b/c I prefer the ease of American buttercream as well, but dang, you just can’t beat the velvety creaminess of a true buttercream! Wow! That cake is BEAUTIFUL! 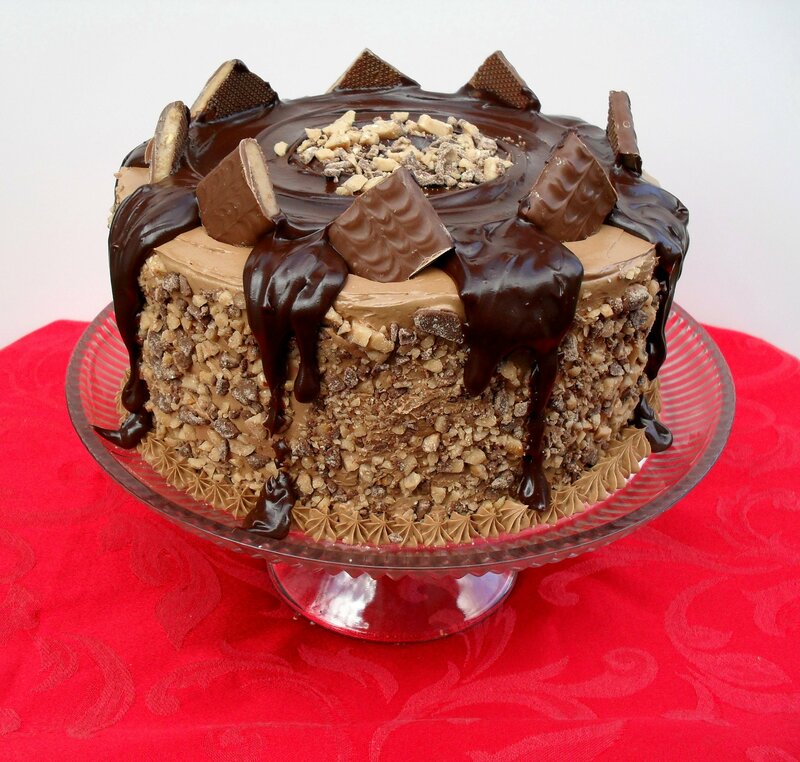 I can’t wait to try it for my friend’s birthday coming up; she’s a Heath Bar fanatic! Dear veronica, I cannot tell you how thankful I am for this recipe of yours! I ve tried baking cakes like twice my entire life and this time I wanted to bake one for a friend’s bday, so it had to be absolutely great. 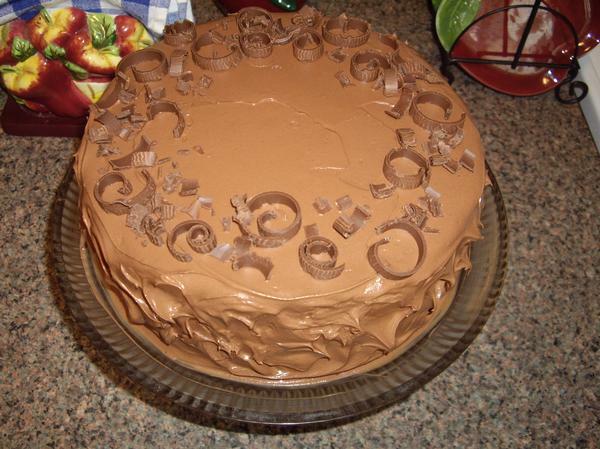 After much scouring through the net for a Kahlua cake that i could make from scratch..i came to your blog.. The cake was simply awesome! The kahlua’s taste wasnt too strong, the buttercream and ganache, sighhh.. was yummy divine! Everyone went all WOWWWW ! and and I owe it all to you!! Thank you!! This looks delicious! Unfortunately my roommate has a nut allergy so I’m going to have to make the toffee by hand and it won’t have that texture to it, but to add some more crunch I’m thinking about coating the sides with a mixture of toffee and cocoa krispies!